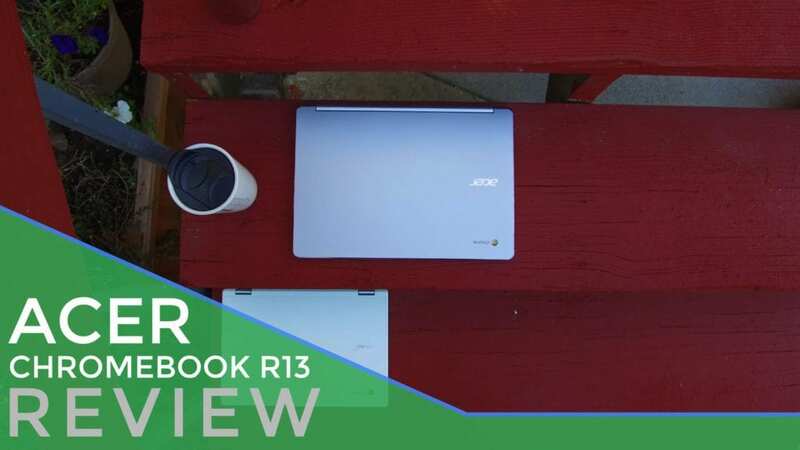 The Acer Chromebook R13 is the first device I’ve reviewed that, at one time, only existed in my head as a codename. You can see in older posts all the things we dug up about ‘Elm’ before it officially became known as the R13, but none of that matters now. What matters now is the Acer Chromebook R13 is here, available, and ready to be your next Chromebook. With great features and great build, this Chromebook could be the one for many of you. Let’s take a deeper look and see what makes this a device worth owning. Make no mistake, the Acer Chromebook R13’s design feels inspired. Made of all aluminum front to back, this device feels way more premium than it’s $399 price tag would suggest. A squarish, dare I say ‘Pixel-esque’ design doesn’t look like anything else Acer makes. That’s not to say Acer makes ugly devices. It simply means OEM’s are really starting to take Chromebooks seriously and giving them original design flares instead of regurgitated aesthetics. It’s not all perfect here, but Acer has done a nice job building a device I like having in front of a client. It is solid, smooth, and without any sharp or oddly cut edges. It’s comfortable to handle, thin enough to feel modern, and light enough to throw in a bag without any worries. Port selection is fair, giving the user access to a single USB-C and USB-A port, full size SD card slot and full size HDMI. The latter is an interesting choice as it could have easily been replaced with another USB-C and given the Chromebook a bit more flexibility. We also have a headphone/mic jack along with a Kensington lock port. Downward/Side firing speakers look and sound quite good, giving a really good, full sound in any orientation. Speaking of orientations, this device (like many Chromebooks coming out in the next few months) is a 360-degree convertible. The hinge allows for all the customary modes: laptop, stand, tent, and tablet. Acer has been at this for some time and really nails the hinge part of the R11. The R13 I tested had a slightly wobbly hinge. As I don’t touch the screen all that much when the device is in laptop mode, this didn’t concern me that much. Additionally, this could have been a singular issue that isn’t present in all devices. It wasn’t unusable. It simply had a bit more play than I like to see in these hinges. Given how well the R11’s hinge operates, I’m inclined to think this may only affect my device. The screen itself is quite good. Though not incredibly bright, the colors and viewing angles are very good for a device in this price range. It is a glossy display with full touch capability, so be prepared to clean it regularly as it will pick up fingerprints. Outdoor viewing is possible, but not optimal. I’d keep this guy indoors for the best experience. Things stay sharp, if a bit small, on the screen at it’s native resolution of 1920×1080. For me, I’d rather have a 1600×900 (or 3200×1800 like the HP 13 G1) display on a screen this size as 1080p fits best on 15.6″ screens, but I’ll discuss that further in another post another day. Additionally, a 13″ 16:9 display makes for an awkward tablet mode. I’d argue that the iPad Pro is roughly the same diagonal size, but being more square in its dimensions, the iPad feels more natural in both portrait and landscape modes. This is not unique to Acer. There are many other 16:9 devices that don’t do the tablet thing well. It’s something I hope to see change down the road. I’d also love to see Chromebooks start getting the bezel sized down a bit. For convertibles, we need to keep some bezel, sure. But they are still quite large for now. Overall, though, the screen performed well and wasn’t really an issue at all. Acer has always made decent keyboards. I have yet to type on an Acer and get the ‘wow’ factor I get from Lenovo, but that’s OK. I’m not particularly hard on keyboards and not very picky, so most Chromebook keyboards are fine by me. I can appreciate a great keyboard, but it’s rare I find a keyboard I really hate. This one performed great for me. Decent travel and click with enough spacing to feel very comfy the whole time. The trackpad was quite good as well. Again, I had a little play in the trackpad (similar, but nowhere near as bad as the first HP 13 G1 I had) that is a little tough to explain. It feels a bit like the trackpad is hovering a fraction of a millimeter above the actual click element, so when you go to click, there is a slight depression before you actually click the button. It made the click feel a bit mushy and made it feel as if some clicks were actually double-clicks. I’ve seen this before in isolated situations, so again I’m inclined to think this would likely not be an issue for most users. On the other hand, the surface of the trackpad is very good. Not glass, the trackpad still slides around very well after hours of use, delivering gestures and pointer tracking like a champ. It is one of the better trackpads I’ve navigated with on a Chromebook. Aside from the strange click mechanics, I really enjoyed this trackpad. Inside, we are met with a unique ARM processor in the MediaTek MT8173. This processor makes its Chromebook debut in the R13 and really holds its own. ARM devices are great at power consumption and thermal control. This device does very well in both areas, never running hot and keeping battery consumption to a minimum. Acer claims 12 hours per charge, and if you keep your screen brightness around 50-60%, that is achievable. With 75% brightness I was easily getting 8-9 hours out of the R13. Equipped with 32GB of internal storage (with some 64GB models arriving soon), I had no issues with space. The 4GB of RAM were plenty when I had multiple tabs, music, Hangouts and Gravit (SVG graphics editor) all running together. I even spent a few sessions using my ASUS USB-C monitor and the device performed like a champ with two 1080p screens pulling at it. All-in-all, I was satisfied with the performance. It wasn’t perfect across the board. There were a few times when I had a stumble here and there, but they were minimal and infrequent. Chrome OS is simply getting better at running well on less and less. Everyone benefits from this. A 10K score on Octane isn’t anything to write home about, but it gets the job done and performance wasn’t really an issue. And that’s the goal with these devices, isn’t it? If we find ourselves doing what we do with our Chromebook and not stopping to think “I wish I had a faster processor,” then we’ve acheived the goal. Performance only needs to exceed the user’s needs by the slightest margin for spec comparisons to truly stop mattering. Let’s tackle what we’ll call the temporary elephant in the room. This device is built and marketed with Android App support in mind and is the first of a new wave of Chromebooks aimed at this same goal. The exclusion of the Play Store at launch was likely not on Acer. While Android App support is coming and may already be available when you read this post or buy your own R13, at launch it is missing. That doesn’t really change a hardware review that much. We’d love to tout the R13’s ability to play Cut The Rope or run Microsoft Office apps. Alas, we can’t just yet. App support is coming, make no mistake. But its delay could hurt sales of this device for the next few weeks until that support arrives. But none of this changes the fact that the Acer R13 is a well-built Chromebook that can still do all the stuff Chromebooks have been doing really well for years. Because of the time we find ourselves in, that question is way harder than it has been in the past. The combination of current and upcoming devices make this a difficult time to zero in on which device is best for you. Would you be happy with your purchase if you bought one? I can confidently say yes to that. The R13 is a beautiful, well-built machine for a very good price. The overall look is way beyond its pricetag and its performance is plenty for most users. A great screen, keyboard and trackpad round out a very solid offering from Acer. I suspect as Android shows up soon on this device, it will be another top seller in Acer’s growing catalog of Chromebooks.